What do you do when your world is suddenly turned upside down due to the negligence of another person? What if that negligence took the lives of those whom you loved? Some people may choose to become calloused and angry towards the perpetrator. However, LDS author, Chris Williams, in his new book titled “Let It Go: A True Story of Tragedy and Forgiveness” suggests that there is a more viable answer to the aforementioned questions – you learn to forgive that person. On 9 February 2007, Chris and his family were on their way home from a night out when their car was hit in the side by a 17-year-old-driver, Cameron White, who was driving from the other direction. That tragic accident claimed the lives of Chris’ wife, Michelle, their unborn son, 11-year-old son, and 9 year-old daughter. Although he was distraught, Chris, not even knowing the young man’s name or the circumstances, immediately decided to forgive him. White would later plead guilty to four counts of second-degree felony automobile homicide. The charges of driving under the influence of alcohol and leaving the scene of an injury accident were dropped. 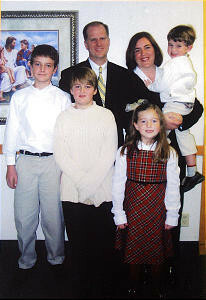 At the time of the accident, Chris was serving as the Bishop of the Crystal Heights Ward of the Salt Lake Highland Stake. 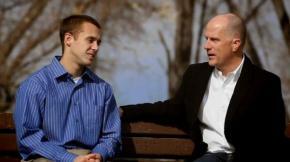 Two days after the accident, he told the LDS Church News that he believed that as a disciple of Jesus Christ, he had no other choice but to forgive Cameron White. He knew in his heart that he had to let go of what had happened. His decision had a major impact on the community, and his story became a living sermon on healing and forgiveness. In the years since the accident, he has given talks, was featured in a Mormon Message video, has spoken at firesides and youth conferences, and has now written a book which is the basis for the new Propel Pictures movie called “Just Let Go” which opened in theaters on Friday, 9 October 2015. I think [forgiveness] may be the greatest virtue on earth, and certainly the most needed. There is so much of meanness and abuse, of intolerance and hatred. There is so great a need for repentance and forgiveness. It is the great principle emphasized in all of scripture, both ancient and modern. Somehow forgiveness, with love and tolerance, accomplishes miracles that can happen in no other way (Gordon B. Hinckley, “Forgiveness,” Ensign, November 2005, 81). The No. 1 question I get is how was I able to do that (forgive and let go)? That’s really why I finally decided I need to just pull all of this (my notes) together and write it out, because it’s a much more personal view to my soul than I’m able to communicate with words. I really have to let people look in and see that there was an enabling power that allowed me to do that which I couldn’t do for myself, and so it really wasn’t about how do I get the power to do this, it was about how do I allow a much greater power than me to help move me forward. And that’s an act of faith, and that’s an act of trust, and I think that’s really the core of what people are struggling with, is they don’t want to give up on the control. Chris was born and raised in Salt lake City, Utah. He served a two-year full-time mission in Paraguay for The Church of Jesus Christ of Latter-day Saints. After graduating from the University of Utah, he went to work as an IT architect and systems engineer. He is now an executive with IBM. He is now married to Mikkel Fuhriman Jones, a widow with two young children. The couple has been blessed with two daughters, and he and his family currently reside in Salt Lake City, Utah. My desire for this movie has been to invite those who need to forgive or be forgiven to just let go of what is holding them back and be healed, just as I and my family have been healed by turning to our faith in Christ. After permission was denied to film at an LDS chapel, I suggested that the intertwined details of my stewardship as a Bishop were not as important to depict as the universal and desperately needed themes of forgiveness, hope and healing. As I reflect back on the years since the crash, I am consistently reminded that, as a disciple of Jesus Christ, I am nothing, and He is everything.